This version of a truly American dessert consists of ripe, juicy fruit and a crunchy, sweet topping. This dessert takes it name from the crumbly mixture that bakes over the fruit into a crisp topping. 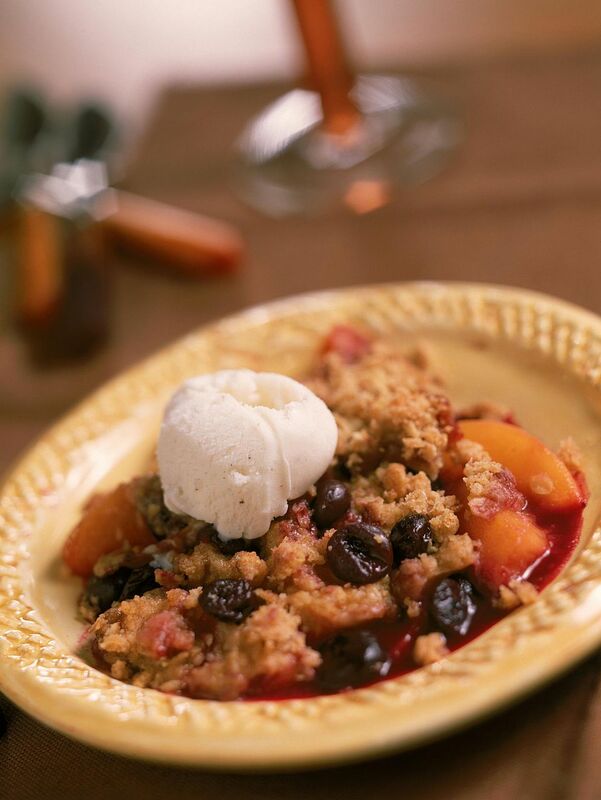 Few things are as wonderful when it comes to seasonal summer eats as this blueberry peach crisp served warm and topped with a scoop of vanilla ice cream. Put the blueberries, peaches, sugar, 1 tablespoon flour, lemon juice and cinnamon in a 1 1/2-quart baking dish. Toss to mix and then spread the fruit mixture evenly in the dish. To make the topping, put the brown sugar and 3/4 cup flour into a medium bowl and stir to mix well. Using two knives or a pastry blender, cut in the butter until the mixture resembles coarse crumbs. Stir in the oats with a fork. Sprinkle the topping evenly over the fruit, then press down gently. Bake for 30 to 35 minutes, or until the topping is crisp and lightly browned. Remove the crisp from the oven and set it on a wire rack to cool slightly before serving. Note: To easily peel peaches, bring a large pot of water to a boil. Immerse the peaches in the boiling water for about a minute, then remove them with a slotted spoon and cool under cold running water. Use a paring knife to slip off the skins. • Combine blueberries and fresh melon chunks and top with chopped fresh mint. • Slice bananas and blueberries, mix with a dash of orange juice and sprinkle with cinnamon. • Toss fresh pineapple chunks and blueberries with finely chopped crystallized ginger. • Spoon fresh blueberries over rice pudding. • Fill a ready-to-serve cookie pie crust with ice cream and top with a mixture of fresh blueberries and raspberries. • Mash fresh blueberries and stir into slightly softened ice cream. • Mix blueberries into a bowl of vanilla yogurt and top with crunchy granola.